Talk to Di Tocker about creating a special cast glass piece for you and your loved ones. Di can customise her style of glass art to personalise a glass art piece just for you. Three glass figures chosen to represent the grown children of the Thomson family. Emma contacted Di from Auckland. Emma and her brother had been searching elusively for the right gift for their Mothers' 75th birthday, when they found Di Tockers' Paper People series. 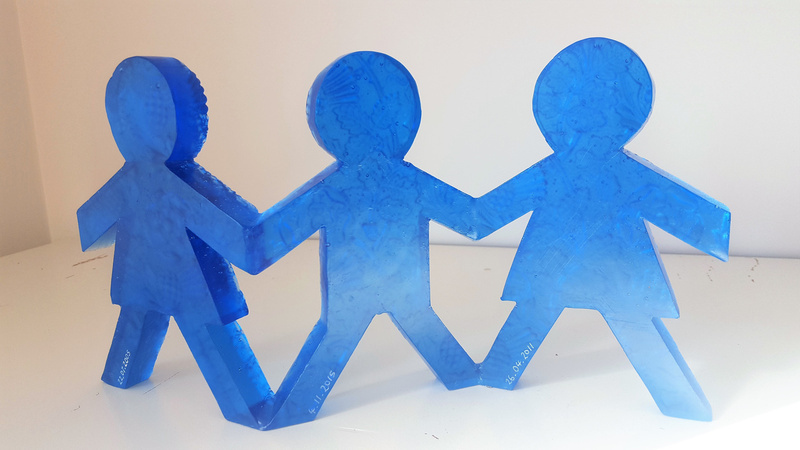 They commissioned Di to create a cast glass girl-boy-girl trio to represent the three grandchildren. To personlise the artwork even more Di engraved the birthdates of the grandchildren on the crystal glass.